When the backup file content is mounted to the recovery image OS file system, Veeam Agent for Linux opens the File Level Restore wizard menu displaying a list of available operations. Start file commander — select this option if you want to start the file manager and work with restored files and folders. To learn more, see Working with Midnight Commander. Stop backup mount — select this option if you want to stop the backup mount session and unmount the backup file content from the /mnt/backup directory of the recovery image OS file system. To learn more, see Stopping Backup Mount Session. Switch to command line — select this option if you want to open the Linux shell prompt and use common Linux command-line tools. 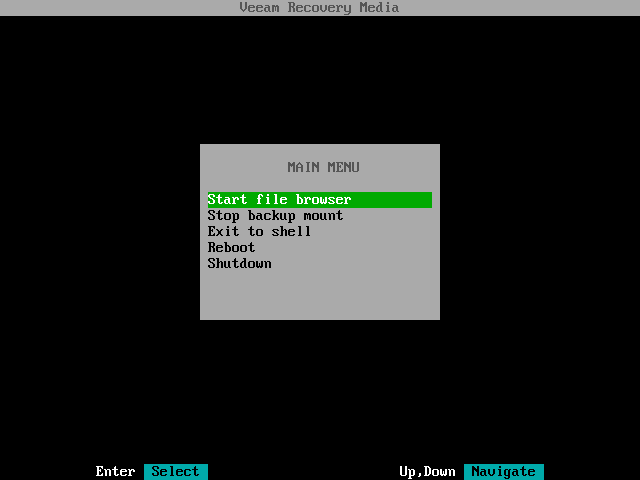 To stop working with the Veeam Recovery Media and shut down or restart your computer, in the File Level Restore wizard menu, select the Reboot or Shutdown option and press Enter.